He’s been here before. Duane Reed dipped his toes into the ocean Saturday at Hapuna Beach to start his fifth Ironman 70.3 Hawaii triathlon. But this year is different. This year, he’s a cancer survivor and he has only one kidney. Six months ago, the Washington state triathlete was laying in a hospital bed and wondering if removing the kidney would halt the aggressive cancer that snuck up on him so quickly. This weekend, the 72-year-old was calmly lining up with 1,599 other athletes to swim 1.2 miles, cycle 56 miles, and run 13.1 miles. In his 70-74 age group, only six men finished the race. Another three dropped out in some of the windiest race conditions ever seen along the Kohala Coast. With a time of 6 hours, 50 minutes and 29 seconds, Reed was second in his age group and 989 overall for the day. 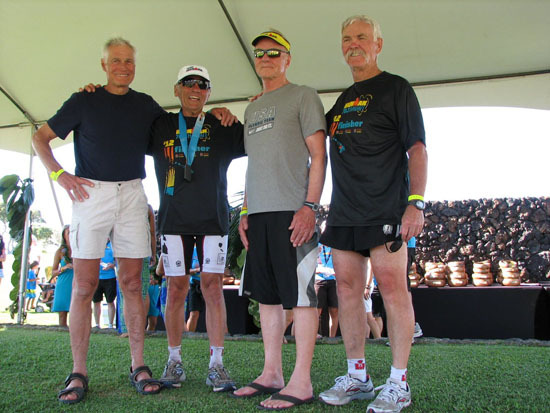 Reed raced lat year in the Ironman 70.3 Hawaii – affectionately called ‘the Honu’ – and won his age group, which qualified him for the Ironman 70.3 World Championship in Las Vegas. Shortly after that race in September, Reed began to notice something wasn’t quite right. The diagnosis was not good. Reed said he will never forget that moment. “The doctor came in and told me, ‘my friend, you gotta problem,'” he said. Reed credits his doctors with acting so decisively and swiftly. “They were real pros and just knew what to do. I’m very grateful,” he said. He never considered he might not race again. Lance, of course, is Lance Armstrong, cycling legend and inspirational cancer survivor. Since retiring from cycling, Armstrong has turned his attention back to triathlon and is hoping to qualify for the Ironman World Championship in October. On Saturday, in his first race on the Big Island, Armstrong set a new course record with a time of 3:50:55. Reed said being a cancer survivor doesn’t define him and he won’t let it stop him from racing in every race he wants. Reed, who works with his son Curtis in the contractor business, caught the racing bug more than 15 years ago after watching his daughters, Jennie and Laura, compete in cycling races. The sisters went on to earn 11 collegiate national championships for the University of Washington. Meanwhile, Reed joined a cycling club in his neighborhood just outside Seattle and started training with real cyclists. Reed keeps his finishers medals on display in his home. “Oh, I think there are probably about 80 or so,” he said. Reed says he wouldn’t have all those medals without the support of his wife, Sue. Reed was there that day, waiting at the finish line. A couple years later, it was Sue’s turn to be waiting at the finish line for her husband. While he raced in the 2003 Ironman World Championship, she served as a catcher – a group of volunteers who literally catch exhausted triathletes as they cross the finish line. Reed likely will take a break from racing this summer, but not for health reasons. Daughter Jennie has been selected for the 2012 Olympic cycling team and, as usual, the whole family will be at the finish line.